It’s officially Summer! The heat is almost here and, even in a cold climate like Maine, many folks are forced to crank up their A/C units to make their home bearable. Both heat and humidity can cause a poorly insulated and leaky home to feel wildly uncomfortable. These inefficient A/C units can cost hundreds of dollars to run not to mention the yearly backbreaking hassle of lugging the units in and out of windows. And a typical air conditioner delivers a double whammy in terms of climate change, since both the electricity they use and the coolants they contain result in planet-warming emissions. So, how do you, as a homeowner, stay cool in your home this summer and help the environment? What many people don’t know is that an energy efficiency upgrade which includes adding insulation, air sealing (plugging holes in your home), and, where it makes sense, replacing you’re A/C unit with a heat pump, not only keeps your home warm and toasty in the winter but will also keep your home much cooler in the summer. More often than not, an efficiency upgrade, especially in our Northern climate, will make your home cool enough that you may not need that outdated air conditioning energy hog. And if you’re like some people who do enjoy a cooler home and conditioned air then installing a heat pump like the Fujitsu RLS3 is a great way to cool your home. An added benefit of a heat pump is that they have the ability to help heat your home in the winter for less. Plugging holes in your homes attic, walls, and basement prevents warm, humid air from entering your living environment and insulation keeps the oppressive summer heat outside where it belongs. In addition to this, air sealing also helps keep allergens like pollen outside so your home’s indoor air is fresh and healthy. 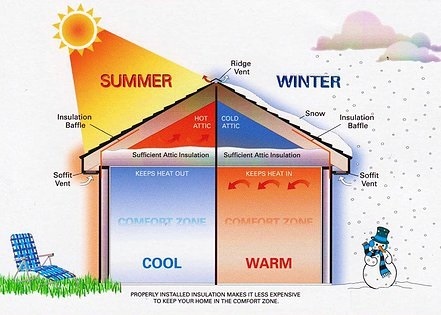 Insulation, air sealing, and heat pumps are cost effective, efficient ways to help keep you and your family cool in the summer and warm in the winter. So don’t sweat it this summer, call Penobscot Home Performance today at 469.6100 and schedule your free one hour energy consultation and learn how you can make your home comfortable, healthy, and energy efficient.